Possibly one of the greatest artistic influences on Vincent van Gogh was Paul Gauguin. Van Gogh and Gauguin met in Paris in November of 1887. Van Gogh had organized an art exhibit from those who Van Gogh called the Impressionists of the Petit Boulevard. After seeing the exhibit Gauguin arranged to trade one of his paintings from Martinique for two of Van Gogh's Sunflowers studies. In February of 1888, Van Gogh decided to move to Arles in Southern France and begin what he called the Studio of the South. His plan for the studio was for it to be an artist colony where artists could work together and inspire each other. As an Art dealer, his brother Theo agreed to try to sell their work. Van Gogh rented four rooms in a building on the Place Lamartine in May. This building, known as the "Yellow House," was to be his Studio of the South. 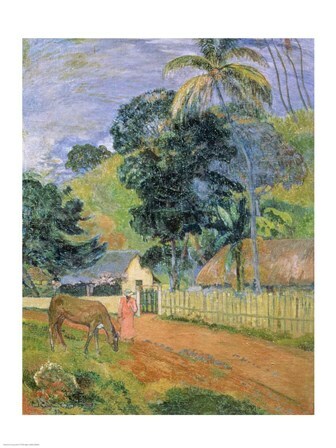 In order to help persuade Gauguin to move to the Studio of the South, Theo provided a 250 franc monthly allowance in exchange for one of Gauguin's paintings each month. Vincent began painting sunflowers to decorate Gauguin's bedroom. These sunflowers would later become one of his signature pieces. During their time together in Arles Gauguin bought a bale of jute from which both artists used for their canvases. This coarse material caused them both to apply the paint more thickly and to use heavier brush strokes. Van Gogh and Gauguin also painted similar subjects in Arles such as landscapes and people in the village. On December 23, 1888 Van Gogh, in a fit of insanity, pursued Gauguin with a knife and threatened him intensely. Later that day Van Gogh returned to their house and cut off a piece of his ear lobe then offered it to a prostitute as a gift. Gauguin swiftly left Arles for Paris. The residents of Arles drew up a petition to have Van Gogh readmitted to the hospital from where he was transferred to a private clinic in Saint-Remy-de-Provence. Van Gogh and Gauguin continued to communicate by letter. After parting ways neither artist could escape the other's influence. Gauguin's work began to have more religious themes after being influenced by Van Gogh's strong religious background. Gauguin also began using brighter colors, especially yellow, and thicker brush strokes like Van Gogh. Van Gogh began to use Gauguin's technique of painting from memory. This caused his paintings to become more decorative and less realistic.